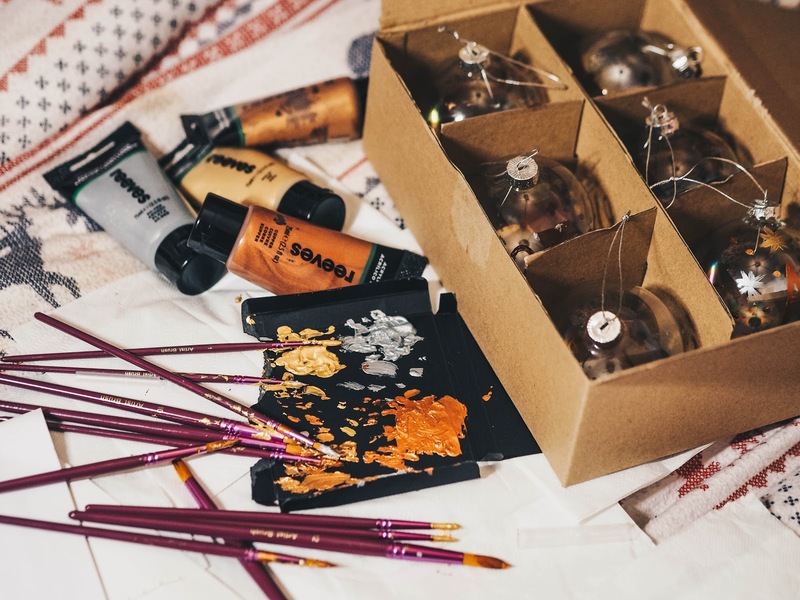 There is nothing I like better during the festive holidays, than to sit down and get creative. Whether it’s making my very own door wreath, gift tags or baking some yummy treats for all to enjoy. 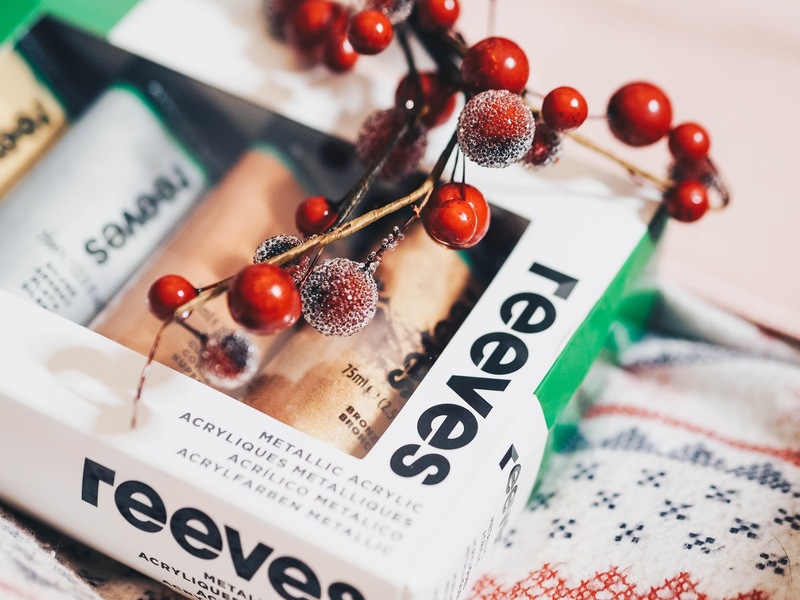 This year, I am super excited to be working with Reeves; one of the world’s leading creativity and lifestyle brands. 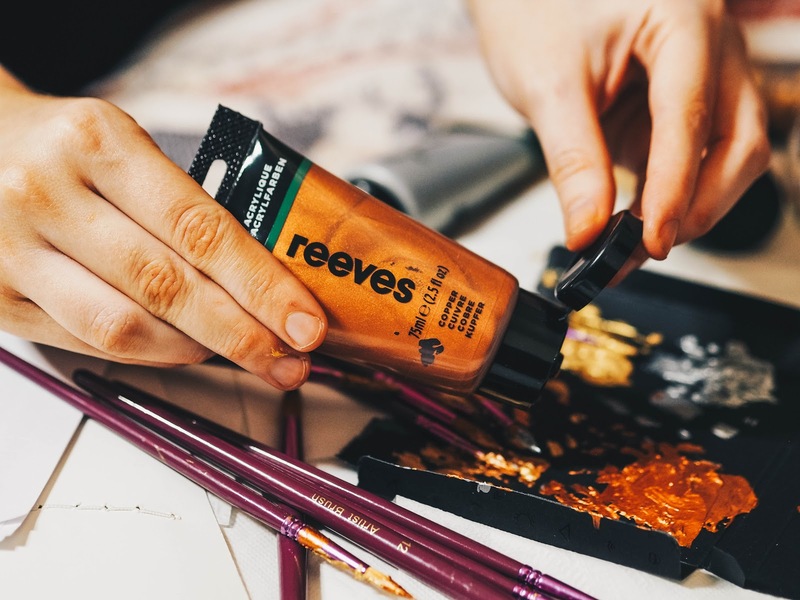 Reeves have recently undergone a huge rebrand, which gave me the perfect opportunity to get a feel of their latest products and decide what creative adventures I could get up to. Reeves have some fantastic creative products available to anyone; from beginner to full blown Van Gogh in the making. Their vibrant and pigment-rich water based Acrylic paints are what attracted me the most and I started to think of some ideas. I had a little brainstorm session with a box of chocolates and a notebook and thought I could create some pretty baubles for our Christmas tree. Our tree is a traditional one and something we never usually add to because the majority of our decorations are old and childhood ones. 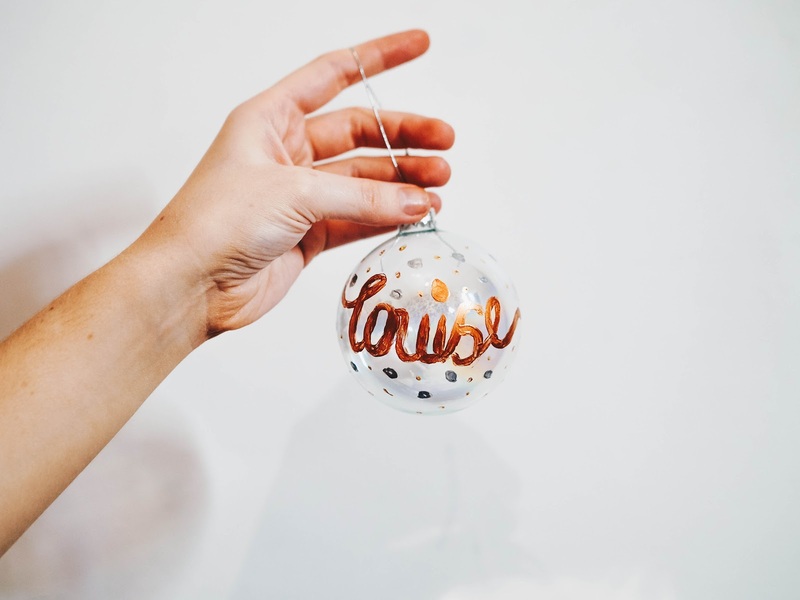 However, with the addition of a cat and a dog in our household, I thought it would be a nice touch to create personalised baubles for everyone; including the fur babies. 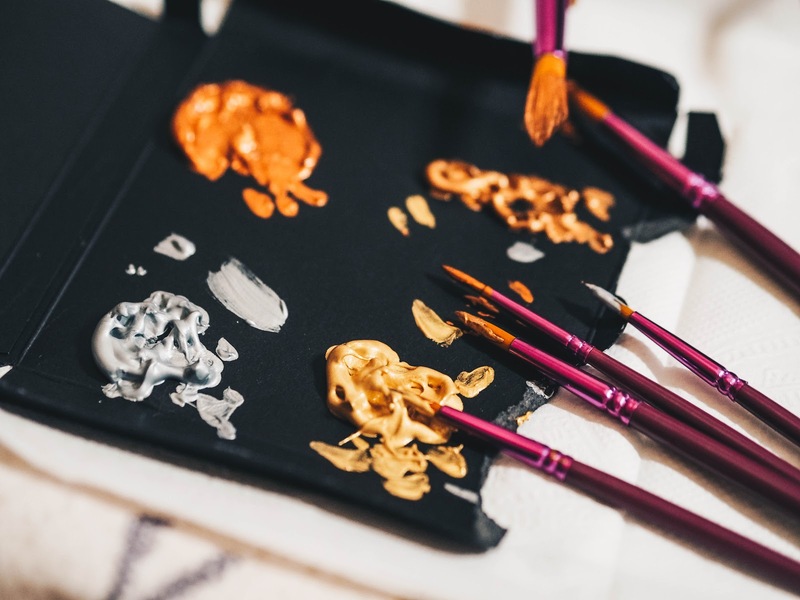 I got started by ordering the brand new re-branded metallicacrylic paints for a little over £10.00 from Amazon; which can be used on pretty much any surface. Try them on wood, fabric, paper and canvas for the best results. I also purchased a box of 6 glass baubles and some acrylic paint brushes with thinner style heads. All in all, I spent just under £30.00, which is an amazing price for personalised baubles. Considering you would spend around that if you bought them already made, you also get the fun out of making them yourself too! My sister and I got started this week and started by sketching out some different fonts for each person’s name in our house. 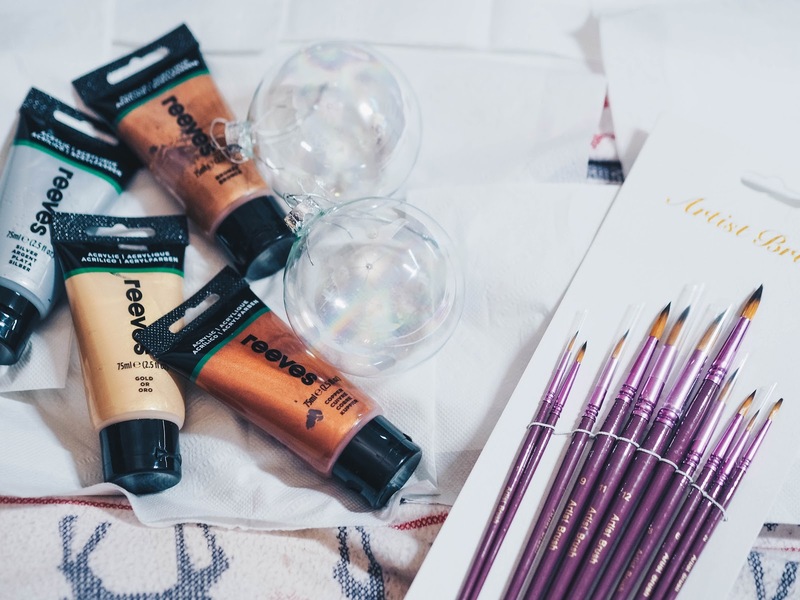 The paints come with 4 different metallic shades; a dark bronze, dark gold, lighter gold and a silver. Perfect shades for Christmas baubles! The process was pretty simple. 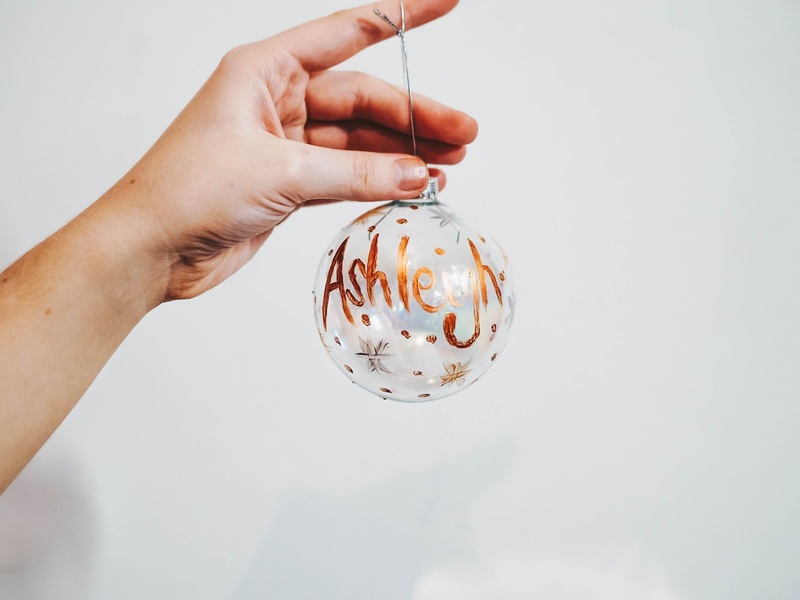 We just painted on each of our names and decorated the surrounding area of each bauble with snowflakes and polka dots. 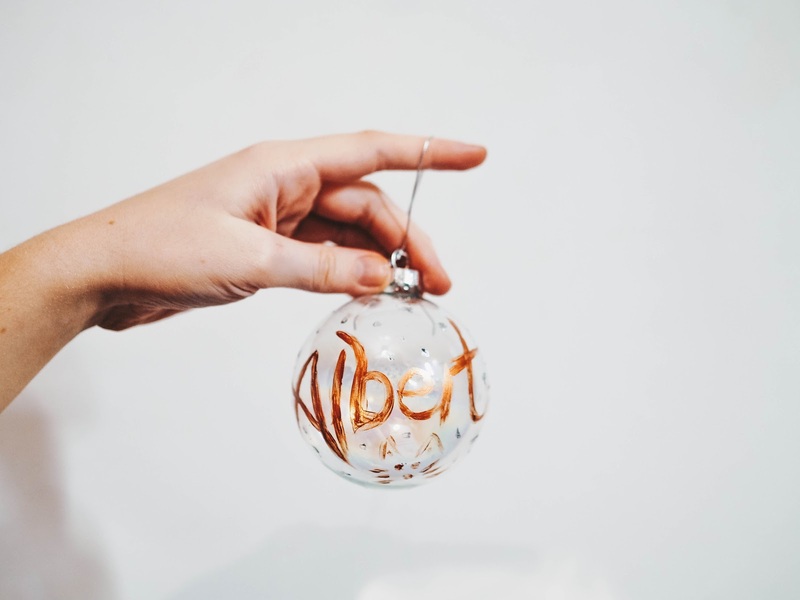 Of course, Elsie and Albert also got their very own pet baubles. 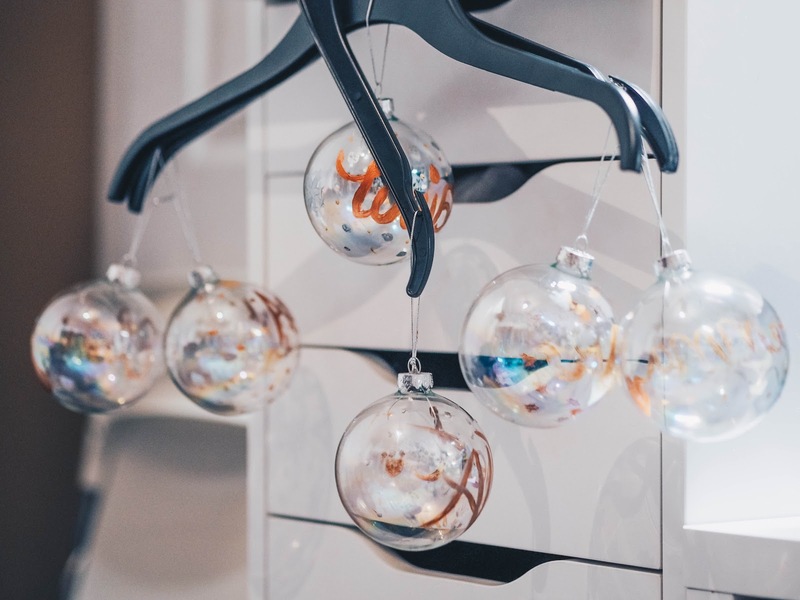 When it came to leaving them to dry, we simply hung each bauble on the end of 3 clothes hangers and left these hanging on an open drawer. 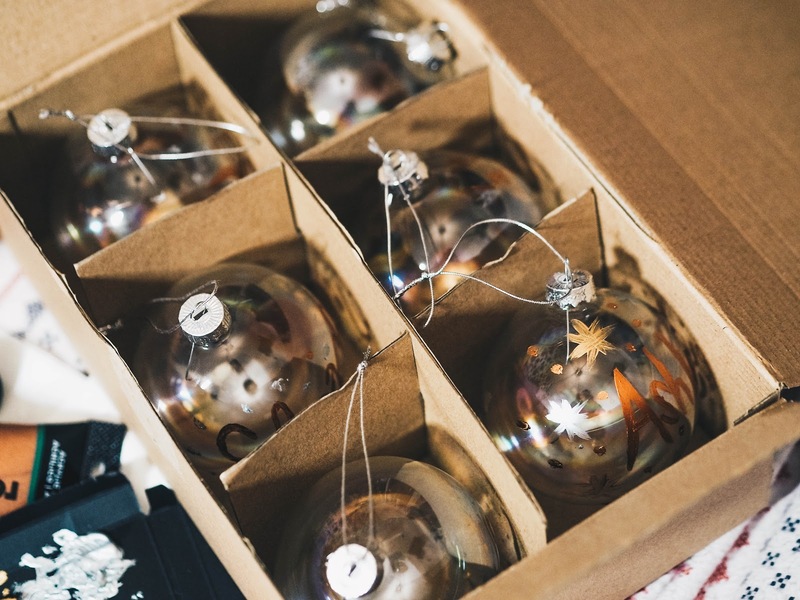 A nifty solution if you decide to customise your own baubles this Christmas! I was surprised at how quickly the paints dried and we was able to pack everything away pretty quickly. The paints themselves are a really good quality, with a hefty 75ml of paint per tube. Definitely more than enough for this particular creation, which means we can keep them aside for any DIY ideas we have in the near future. There have been no problems with the paint coming off as the paint consistency is really thick and of a high quality, which I really do recommend if you’re looking for some high quality metallic paints and not the thin consistency kind! 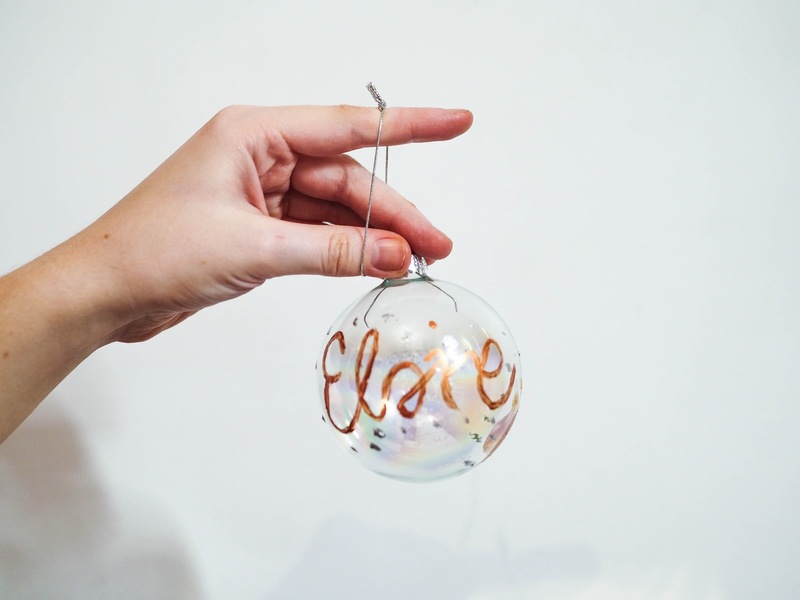 I am really happy with how the baubles turned out and how easy it was to create something personalised for our Christmas tree that needed a serious update! Reeves products are available from Amazon and from a range of retailers across the UK. Disclaimer: In collaboration with Reeves. All words and content are my own. Oh these are lovely and so creative! You'd pay a fortune for those from a craft fayre! I must try them next year! 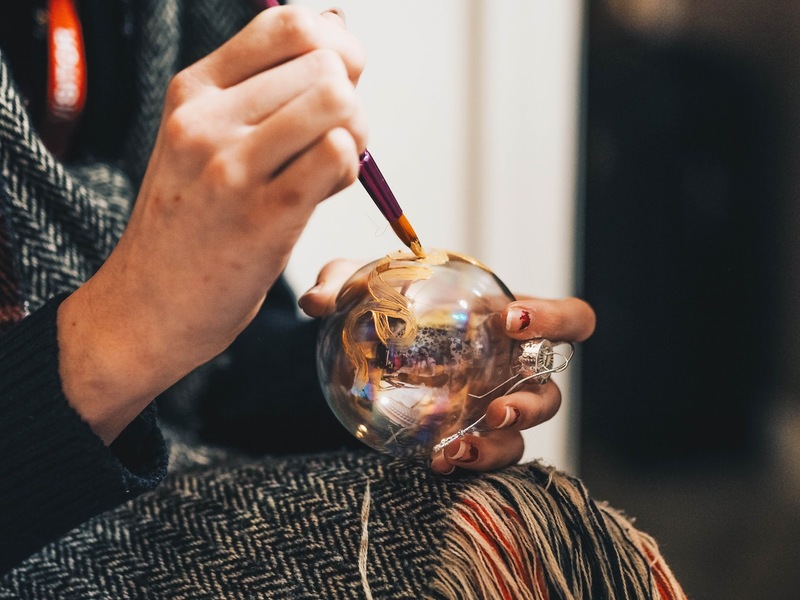 I love the look of the handmade baubles, they’d make lovely presents for Christmas next year and I bet they look great on the tree too. This is really nice, we made some similar ones at Christmas and they turned out so well. Great fun activity for the family. Those are really simple but effective. A bit more special than the shop bought ones. Looks like a totally fun, unique and creative craft. I'd love to give this a shot!